A treasured data backup system holding more 20 years of files was returned to its rightful owners at Art City on Saturday afternoon. A treasured backup drive holding more 20 years of history was returned to its rightful owners at Art City on Saturday afternoon. 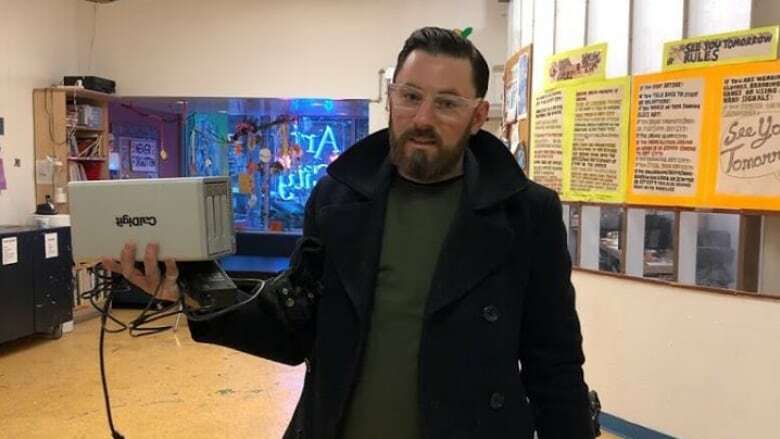 On Boxing Day, the non-profit organization's office on Broadway was broken into; the archive was stolen, along with a 3D printer, several digital cameras and a scanner. The hard drive carried the most amount of value for the organization, as it held files dating back to the beginning of Art City. Managing director Josh Ruth called the robbery a stark lesson. "It felt incredibly vulnerable and alarming. I think those of us who've been with the organization for a number of years, the ideas of having lost that history was really hard to wrap our heads around," he said. "It was a sober realization that in one quick action those things could be taken away." Art City put out a public call for help, and Ruth was blown away by the response. "There's a real sort of mama bear relationship with Art City and the city of Winnipeg. People don't want to see bad things happen to an organization that does such good work," he said. Thanks to the help of pawn shops around the city, the 3D printer and a handful of the missing cameras were recovered. Then on Saturday afternoon, employees received a call saying the hard drive had been found, and would be turned in for a cash reward. "The individual did show up, they refused to come inside because of our security camera. Our employee, out of her bravery and courage, went to an ATM, took money out and paid him," said Ruth. "It seems clear the person knew what this item was, and that we were really looking for it. It was the only thing they returned." Art City has been a staple in Winnipeg for 20 years, with a mission of improving kids' lives through art. The backup held important memories, including for one Winnipeg mom whose kids went through the program. "We went through all the photos and she found images of her kids when they were growing up and she was so overwhelmed," Ruth recalled. He and the mother printed off all the photos, so that she could remember what her kids looked like during their adolescent years. "She was so grateful and emotional, she didn't have any photos of her kids' upbringing," Ruth said. Security upgrades are being planned, including adding more alarms and metal shutters. The organization will also be digitizing its backup system to help mitigate any potential thefts in the future. "Learn from our mistake, and use us as a cautionary tale ...There are some very real challenges facing our city," said Ruth. "We need to all be conscious and mindful and make sure we're not leaving ourselves in a vulnerable position."